Celebrities at G.V. Prakash and Saindhavi Wedding and Reception Ceremony. 1. South Indian actress Sneha in beautiful pink designer pythani silk saree. Gold zari printed work through out purple border,running pallu. Paired with designer short sleeves silk saree blouse with round neck pattern. 2. South Indian actress Amala Paul in beautiful magenta and maroon designer half saree. Embroidered mirrors,applique patch work all over lehenga,gold border. It is a mustard dupatta. Maroon printed work all over and plain border. Paired with designer embroidered sleeveless saree blouse. 3. Singer Mahathi in beautiful blue designer traditional silk saree. Crisscross zari gold printed work all over saree and across the green border. Paired with green designer short sleeves silk saree blouse with pure zari border. 4. South Indian actress Suhasini in beautiful red and gold mixed designer traditional silk saree. Zari work through out border,running pallu. Paired with designer short sleeves silk saree blouse with round neck pattern. 5. 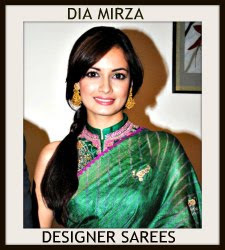 South Indian celebrity in beautiful moss green designer traditional silk saree. Black printed work all over saree. Gold zari printed work through out border,followed by mustard plain border. Paired with designer shoer sleeves silk saree blouse with round neck pattern. 6. Celebrity in beautiful gold and green designer half and half saree. It is a traditional saree. Yellow crisscross printed work across the green saree. Multicolor printed work through out gold border. Paired with pink designer embroidered short sleeves saree blouse with round neck pattern. Multicolor embellished mangos all over blouse. 7. 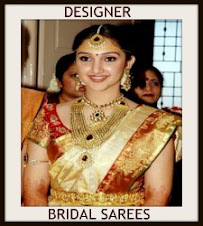 South Indian celebrity in beautiful gold designer traditional plain silk saree with pure zari work border. Paired with gold designer embroidered short sleeves saree blouse with ‘V’ shape neck pattern. 8. South Indian actress in beautiful magenta designer party wear saree. Beautiful printed work all over saree. Paired with black designer cap sleeves saree blouse. 9. South Indian actress in beautiful black and white designer netted half and half saree. Silver plain border bottom of the saree. Heavy embellished patch work through out pink border,followed by plain border. Paired with black designer quarter sleeves saree blouse with square neck pattern. 10. South Indian celebrity in beautiful orange designer traditional silk saree. Gold thread work through out border,running pallu. Paired with pink designer short sleeves saree blouse with round neck pattern. Zari border around it. 11. South Indian celebrity in beautiful orange designer embroidery netted saree. Gold embellished patch work all over saree through out border. Paired with designer matching short sleeves saree blouse. 12. 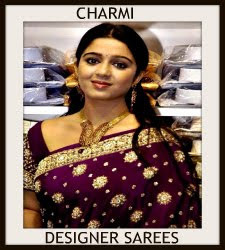 South Indian celebrity in beautiful purple designer traditional silk saree. Gold polka dots through out border. Paired with designer short sleeves saree blouse with round neck pattern. 1.Sumalatha in beautiful cream designer polka dots saree with embroidered border work paired with designer quarter sleeves saree blouse from designer Sabyasachi. 2.Sameera Reddy in beautiful pink and yellow designer lehenga style saree with embroidered and border work paired with designer embroidered short sleeves saree blouse from designer Nikasha. 3.Charmi in beautiful red designer plain saree with embroidered border work paired with designer short sleeves saree blouse from designer Sabyasachi. 4.Siya in beautiful gold designer georgette saree with border border work paired with designer embroidered quarter sleeves saree blouse with sequins buttes. 5.Lakshmi Prasanna in beautiful pink designer embroidery faux georgette saree with sequins buttes and patch work paired with designer embroidered short sleeves saree blouse. 6.Richa Gangopadhyay in beautiful pink designer embroidery georgette drape saree with mirror,sequins buttes and embroidered border work paired with designer sleeveless saree blouse. 7.Shriya in beautiful pink and off white designer dual color embroidery shimmer faux georgette saree with mirror and patch border work paired with designer sleeveless saree blouse for back from designer Manish Malhotra. 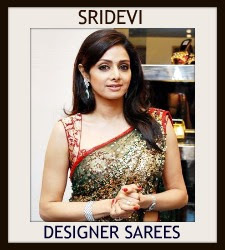 8.Sridevi in beautiful gold designer shimmer faux georgette saree with sequins buttes and border work paired with designer sleeveless saree blouse from designer Manish Malhotra. 9.Kavya Madhavan in beautiful pink designer saree with polka dots and lace border work paired with designer short sleeves saree blouse. 10. Actress in beautiful yellow designer embroidery shimmer faux georgette saree with sequins buttes and embroidered border work paired with designer embroidered short sleeves saree blouse with round neck pattern. 11.Kushboo in beautiful orange and silver designer traditional silk saree with border work paired with designer short sleeves saree blouse. 12. Celebrity in beautiful mustard designer shimmer faux georgette saree, embellished with patch and border work paired with designer sleeveless saree blouse. 13. Actress in beautiful blue and magenta designer shimmer faux georgette saree, embellished with patch and embroidered border work paired with designer sleeveless saree blouse. 14. Actress in beautiful black designer shimmer faux georgette saree, embellished with patch border and embroidered mirror work paired with designer short sleeves saree blouse. 15. Actress in beautiful black designer embroidery shimmer faux georgette saree with sequins buttes,studs,mirror and embroidered border work paired with designer embroidered halter neck saree blouse. 1.Model displaying beautiful blue designer georgette sico saree. Blue and gold designer floral design work all over saree. Blue and gold embellished design work around the plain border. It is paired with spaghetti strap saree blouse. 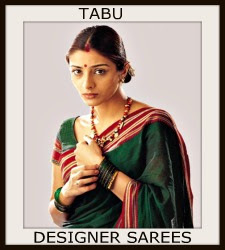 2.Model displaying beautiful brown designer sico saree. Embroidered mirror and gold crisscross stripes all over saree. Gold embellished floral design work through out the border. Gold thread work around the border. Paired with purple designer halter neck saree blouse. 3. Model displaying beautiful white and green designer georgette half and half super net saree. Printed floral design work half of the saree. Purple designer embellished patch work on the green saree. Green printed leaf work on it. Floral design work across the border. It is paired with green designer spaghetti strap saree blouse. 4. Model displaying beautiful magenta designer georgette super netted saree with printed work all over saree. Gold embellished zari design work across the blue border, followed by purple silk border. It is paired with designer sleeveless saree blouse with ‘V’ shape collar neck pattern. 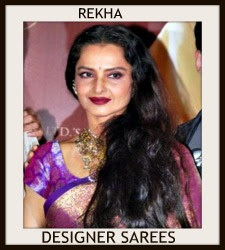 Bollywood celebrity in beautiful black designer plain georgette saree with lace work border at PCJ Delhi Couture Week 2013. Small mirrors through out border. Paired with black designer embroidered sleeveless saree blouse. ‘V’ shape neck pattern for back. Celebrity in beautiful cream and white designer dual color pure georgette saree with gold plain border. Paired with shoulder less saree blouse. 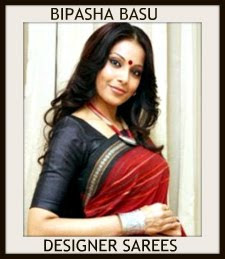 Bollywood celebrity in beautiful maroon designer plain saree with embellished applique patch work border. Paired with maroon designer saree blouse for back. Patch work on it. Left: Bollywood celebrity in beautiful pink and orange designer dual color georgette saree. Paired with designer sleeveless saree blouse. Embellished floral designs on it. Middle: Celebrity in beautiful yellow designer net saree. Crisscross stripes all over saree and magenta border. Paired with designer quarter sleeves saree blouse. 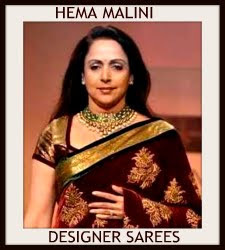 Right: Bollywood celebrity in beautiful black and brown designer dual color saree. Gold vertical lines around it tan border. Paired with designer saree blouse. 1. Model displaying beautiful dark and aqua blue designer dual color georgette embroidery work saree with ethnic cut work, beautiful servo ski embroidered work near by shoulders and embroidered sequins buttes,kundan,mirror work all over saree paired with designer saree blouse. 2. Model displaying beautiful pure lenin khadi georgette saree with zari buttes,pearls,kundan work all over saree and green border,embroidered motifs,thread work on it. It is paired with designer halter neck saree blouse. 3. Model displaying beautiful yellow designer crepe saree with embroidered kundan,pearls all over saree and mango motifs around the border and embroidered border work paired with designer saree blouse. 4.Model displaying beautiful magenta designer pure jacquard crepe saree with embroidered thread,zari,sequins buttes,cutdana embroidered work all over saree and embroidered border paired with designer saree blouse. 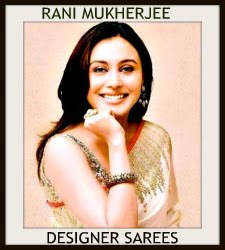 Bollywood actress Kareena Kapoor in beautiful desigenr Sarees. 1.Kareena Kapoor in beautiful blue designer embroidery shimmer faux georgette saree with embroidered sequins buttes,mirror,stones and thread work all over saree and maroon embroidered border paired with designer saree blouse. 2.Kareena Kapoor in beautiful red designer drape saree with printed work all over saree and border paired with designer saree blouse. 3.Kareena Kapoor in beautiful magenta designer embroidery shimmer saree, embellished with patch work all over saree and border paired with designer spaghetti strap saree blouse. 4. Kareena Kapoor in beautiful cream designer traditional silk saree with brasso work all over and red border,gold zari work on it paired with designer benarasi short sleeves saree blouse. Left: Model walks in beautiful green designer embroidery net saree. Embroidered zardosi work all over saree. Gold thread work through out pink border. Paired with pink designer mini sleeves saree blouse with square neck pattern. Middle: Model walks in beautiful blue and sea green designer georgette saree with embellished patch work border. Paired with blue designer full sleeves saree blouse. Printed floral designs work all over. Right: Model displaying beautiful magenta designer embroidery net saree. Shimmering work all over saree. Embellished rose flowers on it and through out border. Paired with red designer mini sleeves saree blouse. South Indian actress Madhavi Latha in beautiful white designer traditional silk saree with gold zari border work paired with designer cap sleeves saree blouse. Madhavi Latha displaying beautiful green designer traditional silk saree with pallu border and printed work. Madhavi Latha displaying orange designer uppada silk saree with printed and border work. Madhavi Latha displaying pink designer silk saree with gold border work. Madhavi Latha displaying yellow designer silk saree with paint work and double border work. Madhavi Latha displaying beautiful magenta designer kanchipuram silk saree with printed and zari border work. Left: Model displaying beautiful yellow and magenta designer benarasi lehenga style saree with embroidery sequins buttes ,self printed and purple border is highlighted with embroidery brocade,woven and contrast with shimmer dupatta paired with designer saree blouse. Middle: Model walks in beautiful blue designer benarasi silk lehenga with maroon georgette dupatta, printed work border and embroidered sequins work around the border paired with designer sleeveless saree blouse. Right: Model displaying beautiful pink designer benarasi lehenga style saree with floral printed all over saree, reshmi thread embroidery,multicolor border and green netted dupatta paired with designer sleeveless saree blouse. Left:Tamanna in green and purple designer dual color gorgeous saree paired with designer sleeveless saree blouse. Middle:Tamanna in beautiful multicolor designer saree with crush work paired with designer sleeveless saree blouse. Right:Tamanna in beautiful magenta designer plain saree paired with designer sleeveless saree blouse. Left: South Indian actress Arundhati in beautiful yellow designer PSR silk saree. Orange self printed work through out the saree. Grey and red designer double border,followed by gold plain border. It is paired with red designer ruffled sleeves saree blouse with round neck pattern. Embroidered zardosi work around the neck. Right: Arundhati in beautiful blue and magenta designer traditional PSR silk saree. Multicolor horizontal stripes and embellished floral design work all over saree. It is multicolor silk border. Running pallu through out the border.It is paired with designer saree blouse. 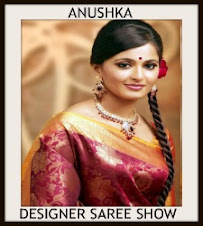 Left: South Indian actress Anushka in beautiful pink and orange designer dual color embroidery saree. Mirror work on it. 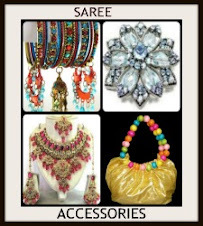 It is paired with pink designer backless saree blouse. It is a sleeveless saree blouse. Right: Anushka in beautiful purple and magenta designer dual color saree with green embroidered border. It is paired with black designer embroidered sleeveless saree blouse for back. Embroidered mirror all over. Gold studs across the border. Left: Model displaying beautiful magenta designer pure kanchi silk saree with zoomdani work,embellished wave design,zari work all over saree and mustard design border paired with designer full sleeves saree blouse. Right: Model displaying beautiful gold and gold mixed designer traditional pure kanchi pattu saree with gold zari ,zari woven work all over saree, rich pallu and mustard border paired with designer short sleeves saree blouse with collar neck pattern. Model walks in beautiful white and magenta designer half and half saree at Fashion Thrills Fashion Show Event. White embellished patch work through out white saree. Embroidered mirrors and sequins buttes all over magenta. White embellished patch work around the gold plain border. Multicolor embellished patch border around it. Paired with magenta designer short sleeves saree blouse with round neck pattern. South Indian celebrity and Singer Sunitha in beautiful magenta designer net saree with embroidered zardosi and tricolor border paired with designer short sleeves saree blouse. South Indian actress Divya Singh in beautiful green and magenta designer half saree. Gold mango work across the magenta color. Red small mango work all over green color. Gold thread work around the red mango work. Gold thread work across the magenta border,followed by green,magenta plain borders. It is yellow georgette dupatta. Multicolor stripes all over dupatta with green border. It is paired with green and magenta designer matching ruffled sleeves saree blouse with round neck pattern. Model displaying beautiful magenta and off white designer silk half and half saree. Heavy embroidered sequins buttes,small mirrors all over saree. Printed floral designs work all over saree. Silver thread work across the border. Paired with cream designer short sleeves saree blouse with round neck pattern. Gold thread work across the neck border. 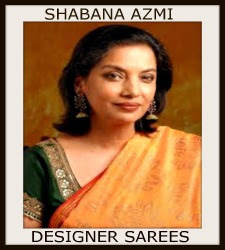 Bollywood celebrity in beautiful magenta designer traditional silk saree at Abhinav and Ashima Shukla Wedding Reception.Silver designer zari leafs and black self printed work all over saree.Green silk border bottom of the saree.Paired with matching short sleeves saree blouse with zari work border.